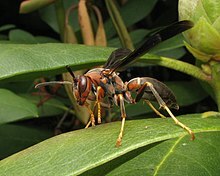 Wasps of the cosmopolitan genus Polistes (the only genus in the tribe Polistini) are the most familiar of the polistine wasps, and are the most common type of paper wasp in North America. It is also the single largest genus within the family Vespidae, with over 300 recognized species and subspecies. Their innate preferences for nest-building sites leads them to commonly build nests on human habitation, where they can be very unwelcome; although generally not aggressive, they can be provoked into defending their nests. All species are predatory, and they may consume large numbers of caterpillars, in which respect they are generally considered beneficial. The European paper wasp, Polistes dominula, was introduced into the US about 1981 and has quickly spread throughout most of the country, in most cases replacing native species within a few years. This species is very commonly mistaken for a yellow jacket, as it is black, strongly marked with yellow, and quite different from the native North American species of Polistes. The cuckoo wasp, Polistes sulcifer, is an obligate social parasite, whose only host is P. dominula. Polistes annularis, whose species name is Latin for "ringed", is also known for its distinctive red body color. Polistes metricus adults malaxate their insect prey by chewing them into a pulp, sucking out and ingesting the body fluids, then feeding the rest of the morsel to their larvae. The most widely distributed South American wasp species, Polistes versicolor, is particularly common in the southeastern Brazilian states. This social wasp is commonly referred to as the yellow paper wasp due to the distinct yellow bands found on its thorax and abdomen. Polistes wasps can be identified by their characteristic flight; their long legs dangle below their bodies, which are also more slender than a yellow jacket. The founding stage begins in the spring when a solitary female (the "foundress") (or a small group of related females) initiates the construction of a nest. The wasps begin by fashioning a petiole, a short stalk which will connect the new nest to a substrate (often the eave of a house or outbuilding), and building a single brood cell at the end of it. Further cells are added laterally in a hexagonal pattern, each cell surrounded by six others. Although nests can achieve impressive sizes, they almost always maintain a basic shape: petiolated (stellocyttarous), single-combed, unprotected, and open (gymnodomous). Eggs are laid by the foundress directly into the brood cells and are guarded by the foundress and the assisting females (if present). After the first larvae hatch, the foundress feeds them via progressive provisioning, bringing softened caterpillar flesh to the larvae multiple times throughout their development (as opposed to the one-time provisioning seen in some other hymenopteran groups). Each of this first seasonal brood of new paper wasps is exclusively female and destined to a subordinate worker position inside the nest; they do not found their own nests and instead assist their mother in the care and maintenance of future sisters. Some foundress wasps do not build their own nests, but rather attempt to usurp that of another female. These usurpation attempts may or may not be successful, but almost always result in impressive displays of aggression and violence. Females may also adopt a more peaceful alternative reproduction strategy by joining the nest of a close relative (usually a sister) and working as assisting females. In the latter case, such cofounding females are generally, but not exclusively, close relatives. The worker phase usually begins in the early summer, roughly two months after colony initiation, with the emergence of the first workers. These new females take up most of the colony's work duties, foraging, caring for brood, and maintaining the structure of the nest. Around this time, those females which assisted in nest foundation (if present) are driven from the nest by aggressive behavior on the part of the foundress, and leave either to start their own late-season nests or usurp another's. The reproductive phase of the colony begins when the first female reproductives (the gynes) emerge from their brood cells. These reproductives differ from their worker sisters by having increased levels of fat stores and cryoprotectant carbohydrate compounds (allowing them to survive the overwintering period). These reproductives contribute genes directly to the next generation, while their worker sisters normally pass along their genes indirectly. Once male reproductives emerge and both males and females disperse from the natal nest for mating flights, the so-called intermediate phase begins. Brood care and foraging behavior decline and worker numbers drop as dying individuals are no longer replaced by new ones. Intracolonial aggression increases and the social cohesion of the nest declines. In temperate Polistes species, individuals (almost exclusively inseminated females) gather in groups of up to 50 individuals and seek a sheltered location (called a hibernaculum) in which to overwinter. The reproductive behavior of Polistes wasps provided some of the first evidence for the mathematical biologist W. D. Hamilton's 1964 theory of kin selection. Hamilton showed that animals such as workers could be expected to provide assistance to relatives such as their queens according to the costs and benefits involved (K) and their degree of genetic relatedness (r), and gave the rule that now carries his name, K > 1/r. Early caution existed among researchers as to whether social insects could really assess their relatedness. Hamilton himself suggested an alternative possibility, namely that kin could become associated simply by "population viscosity"—that offspring tend not to disperse far from their birthplaces—and West-Eberhard (1969) found some evidence for this in Polistes. However, Polistes species are now known to learn and remember chemical signals (hydrocarbons) picked up from the nest to distinguish nestmates accurately from nonrelatives. Morphologically, the foundress and subordinate reproductive members of the colony differ little. However, behavioral differentiation occurs among females both between and within generations. For example, in the species Polistes humilis the queen displays a "tail-wagging" behavior to assert her dominance over the worker class. Similarly, Polistes canadensis also possesses behavioral differentiation between the queen and her nestmates, with the queen often suppressing the aggressive behavior of subordinates through lateral abdominal vibrations and stroking. In contrast, unmated females are not aggressive. In Polistes exclamans queens have different amounts of glucose, fructose, and trehalose which lead to different cryoprotectant levels. This alters their survivability in different temperatures, increasing their odds of reproduction. Females in P. bellicosus are also morphologically similar between caste separations. For example, a P. bellicosus worker could become queen, and egg-layer, if all of the original foundresses die or leave the nest. This is also true for Polistes dorsalis, which also displays dominant behavior. Despite having no distinct morphological caste, roles of P. dorsalis tend to be fixed in a system with division of labor. Polistes spp. discriminate colony mates using an acquired (i.e. learned) cue, absorbing hydrocarbons from the natal nest at eclosion. This cuticular hydrocarbon "signature" is derived both from the plant material and the foundress-applied substances from which the nest is made. Studies of Polistes fuscatus have researched the molecular basis of the recognition "pheromone" used by the wasps, and indicate at least some of the recognizable labels have the same chemical constituents as the adult cuticular hydrocarbons. Similar recognition is found in Polistes metricus. Dominant individuals of P. dominula have differing cuticular profiles from workers, and the frequent observations of the dominant female stroking its gaster across the nest surface, combined with its staying on the nest for longer times than subordinates, suggests the dominant individual may contribute more to the nest odor. P. carolina females do not preferentially feed their own progeny (as larvae), so it may be the case that nest odor only serves as a likely indicator of relatedness, rather than a specific label of kinship. Further to this recognition of nestmates, Polistes biglumis foundresses discriminate between 'alien' eggs and their own via differential oophagy. The mechanism of differentiation is not elucidated, but is thought to be based upon differences in cuticular hydrocarbon odor. Polistes chinensis antennalis, Asian paper wasp has established itself as a pest species in New Zealand. Along with the German and common wasps, the Asian and Australian paper wasps (P. chinensis and P. humilis) are considered pests in New Zealand. Arriving in 1979, the Asian paper wasp has established itself in both the North Island and the northern parts of the South Island. Because it competes with native species (such as the kaka) for insects, nectar, and honeydew, it is a hindrance to conservation efforts. Various other insects are parasites or parasitoids of Polistes, including flies (e.g., Sarcophagidae), mantispids, and wasps in the families Torymidae, Mutillidae (rarely), Braconidae, and Ichneumonidae (e.g. Latibulus argiolus). Some more specialized groups are more intimately associated with Polistes; this includes strepsipterans in the family Stylopidae (genus Xenos), wasps of the genus Elasmus (formerly placed in their own family, "Elasmidae"), and wasps in the family Trigonalidae. Within the Polistes family are three known social obligate parasites: P. sulcifer, P. atrimandibularis, and P. semenowi, which parasitize other Polistes wasps. Known host species of these parasites are P. dominulus, P. gallicus, P. nimphus, P. associus, and P. biglumis. Although these parasites differ in their host invasion strategies, their end goal is to successfully infiltrate the host nest and reproduce at the host's expense. ^ James M. Carpenter (2008). "Review of Hawaiian Vespidae (Hymenoptera)" (PDF). Occasional Papers of the Bishop Museum. 99: 1–18. ^ Cotinis (2004). "Bug Guide". ^ Hunt, J (1984). "Adult nourishment during larval provisioning in a primitively eusocial wasp, Polistes metricus Say". Insectes Sociaux. 31 (4): 452–460. doi:10.1007/bf02223659. ^ a b Hudson K. Reeve (1991). "Polistes". In Kenneth G. Ross; Robert W. Mathew. The Social Biology of Wasps. Cornell University Press. pp. 99–148. ISBN 978-0-8014-9906-7. ^ Hamilton, W. D. (1964). "The genetical evolution of social behaviour, I & II". Journal of Theoretical Biology. 7 (1): 17–52. doi:10.1016/0022-5193(64)90039-6. PMID 5875340. ^ West-Eberhard, Mary Jane (10 April 2003). Developmental Plasticity and Evolution. Oxford University Press. p. 447. ISBN 978-0-19-512235-0. ^ Clapperton, B. Kay; Lo, Peter (April 2005). "Nesting biology of Asian paper wasps Polistes chinensis antennalis Pérez, and Australian paper wasps P. humilis(Fab.) (Hymenoptera: Vespidae) in northern New Zealand". New Zealand Journal of Zoology. 27 (3): 189. doi:10.1080/03014223.2000.9518225. ^ West-Eberhard, Mary Jane. "Dominance Relations in Polistes canadensis (L.), a Tropical Social Wasp." Monitore Zoologico Italiano 20.3 (1986): 263-81. ^ Hughes, Colin R.; Queller, David C.; Strassman, Joan E.; Davis, Scott K. (1993). "Relatedness and altruism in Polistes wasps". Behavioral Ecology. 4 (2): 128–137. doi:10.1093/beheco/4.2.128. ^ Jandt, J.M. ; E. A. Tibbetts; A. L. Toth (2013). "Polistes paper wasps: a model genus for the study of social dominance hierarchies" (PDF). International Journal for the Study of Social Arthropods. Retrieved 16 October 2014. ^ George J. Gamboa; Thaddeus A. Grudzien; Karl Espelie; Elizabeth A. Bura (1996). "Kin recognition pheromones in social wasps: combining chemical and behavioural evidence" (PDF). Animal Behaviour. 51 (1996): 625–629. doi:10.1006/anbe.1996.0067. ^ Annie Bonavita-Cougourdan; Guy Theraulaz; Anne-Geneviève Bagnères; Maurice Roux; Michel Pratte; Eric Provost; Jean-Luc Clément (1991). "Cuticular hydrocarbons, social organisation and ovarian development in a polistine wasp: Polistes dominulus" (PDF). Comparative Biochemistry and Physiology B: Biochemistry and Molecular Biology of Comparative Biochemistry and Physiology. 100 (4): 667–680. doi:10.1016/0305-0491(91)90272-F.
^ J. E. Strassmann, P. Seppä & D. C. Queller (2000). "Absence of within-colony kin discrimination: foundresses of the social wasp, Polistes carolina, do not prefer their own larvae" (PDF). Naturwissenschaften. 87 (6): 266–269. doi:10.1007/s001140050718. PMID 10929290. ^ M. C. Lorenzi & F. Filippone (2000). "Opportunistic discrimination of alien eggs by social wasps (Polistes biglumis, Hymenoptera Vespidae): a defence against social parasitism?". Behavioral Ecology and Sociobiology. 48 (5): 402–406. doi:10.1007/s002650000251. ^ "Asian Paper Wasp". MAF Biosecurity New Zealand. 18 June 2008. Retrieved 26 February 2011. ^ B. Kay Clapperton (1999). "Abundance of wasps and prey consumption of paper wasps (Hymenoptera, Vespidae: Polistinae) in Northland, New Zealand" (PDF). New Zealand Journal of Ecology. 23 (1): 11–19. ^ Richard J. Toft & Richard J. Harris (2004). "Can trapping control Asian paper wasp (Polistes chinensis antennalis) populations?" (PDF). New Zealand Journal of Ecology. 28 (2): 279–282. ^ Cervo, Rita (2006-12-29). "Polistes wasps and their social parasites: an overview" (PDF). Ann. Zool. Fennici. 43: 531–549. Retrieved 2014-11-13. Stefano Turillazzi & Mary Jane West-Eberhard (1996). The Natural History and Evolution of Paper-Wasps. Oxford University Press. ISBN 978-0-19-854947-5. I. Karsai & G. Theraulaz (1995). "Nest building in a social wasp: postures and constraints (Hymenoptera: Vespidae)". Sociobiology. 26 (1): 83–114. I. Karsai & Z. Penzes (1996). "Intra-specific variation in the comb structure of Polistes dominulus: parameters, maturation, nest size and cell arrangement". Insectes Sociaux. 43 (3): 277–296. doi:10.1007/BF01242929. 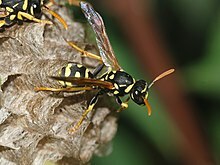 Wikimedia Commons has media related to Polistes.